Merry Christmas! A Kit of the Month project for the Unity blog. I want to wish you a merry Christmas and happy holidays. Today, I am up on the Unity blog with this project for Kit of the Month Monday. Sentiment: Sending love with all my heart. Congratulations. This card was made using vellum to stamp the floral image from the December 2017 Kit of the Month called Start of Something New. I made a video tutorial of this vellum card. And because it is Christmas, I am sharing some recent holiday cards. Supplies: Unity Stamp Co. Kit of the Month December 2017, Bright Spirits and Cheerful Prancing; Copic markers, vellum, dies by Lil' Inker Design, My Creative Time, Spellbinders and My Favorite Things. Here's wishing you and yours a wonderful Christmas and the happiest of New Years. Christmas poinsettia wine bottle hostess gift tag for CardMaker. 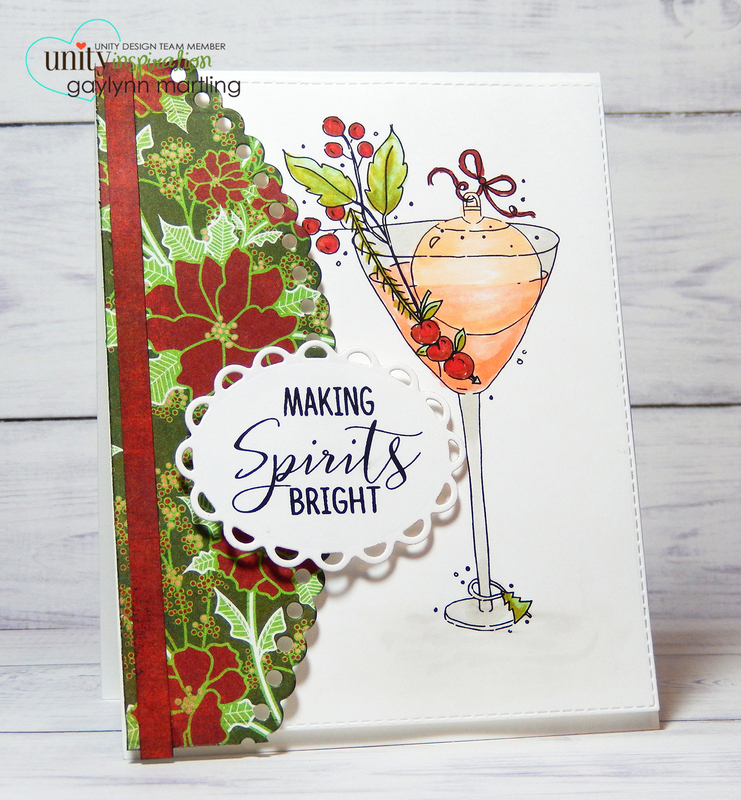 Today, I am sharing a last minute Christmas idea for the CardMaker blog. For Christmas parties, this is an easy way to dress up a wine bottle hostess gift. I used watercolor for this wine bottle tag. To see all of the details, a tutorial and more photos of this project, visit the CardMaker blog. Supplies: Unity Stamp Co. Poinsettia With Love, Canson watercolor paper, water brush, Ranger distress markers and archival ink, Pretty Pink Posh sequins and Papertrey Ink dies. Neutral watercolor flowers celebrate handmade card. 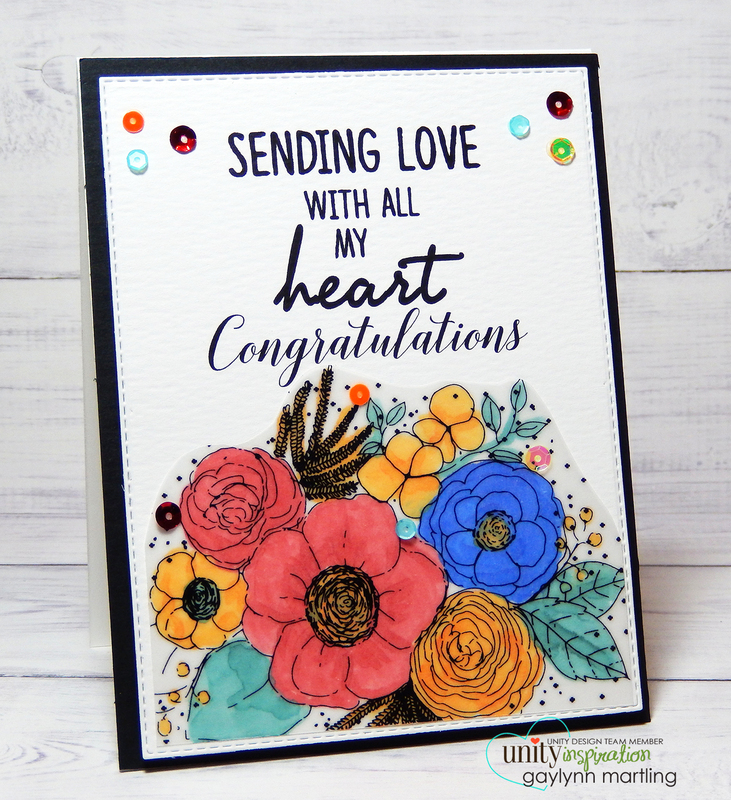 Here is a floral celebration card, perfect for birthday, congratulations, graduation, engagement, anniversary and more. Sentiment: Celebrate every little thing. For this card, I stamped the flowers and then die-cut the image panel. I used watercolor pencils for watercolor. And, I used neutrals for this project. Here is a video tutorial on how this card came to life. Supplies: Unity Stamp Co. God Is Love by Graciellie Design and Things Will Work Out by Lisa Arana; DCWV paper, Derwent Inktense watercolor pencils, Ranger watercolor paper and My Creative Time dies. 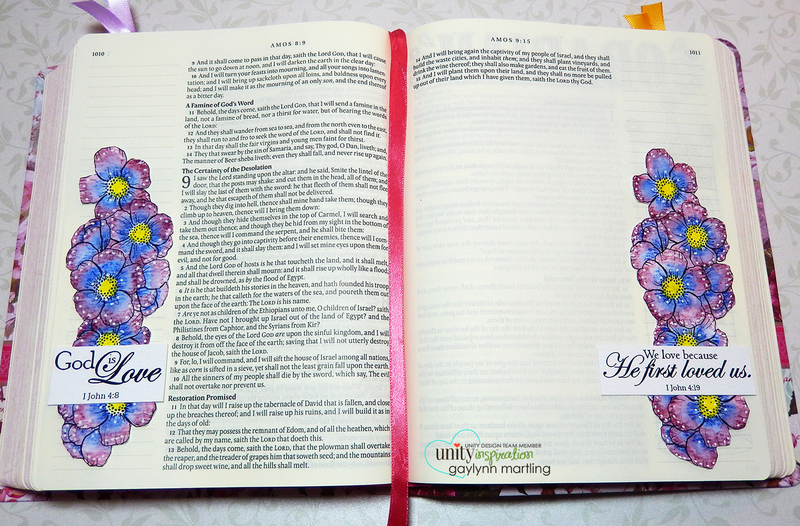 Bible journal watercolor flowers & Sharpie accents. This is a two page bible journal watercolor project. I used watercolor paper to stamp the flowers and then used watercolor. Once dry, white Sharpie accents were added for more interest. Here are the two pages a little closer. I made a video tutorial for these florals. For more of my bible journaling ideas and tips, see my other posts in the category of bible journal. Included in Word Art Wednesday Challenge #312 - #313 Anything Goes. Supplies: Unity Stamp Co. God Is Love by Graciellie Design, Derwent Inktense watercolor pencils, water brush, My Creative Bible, Ranger watercolor paper and a Sharpie pen. 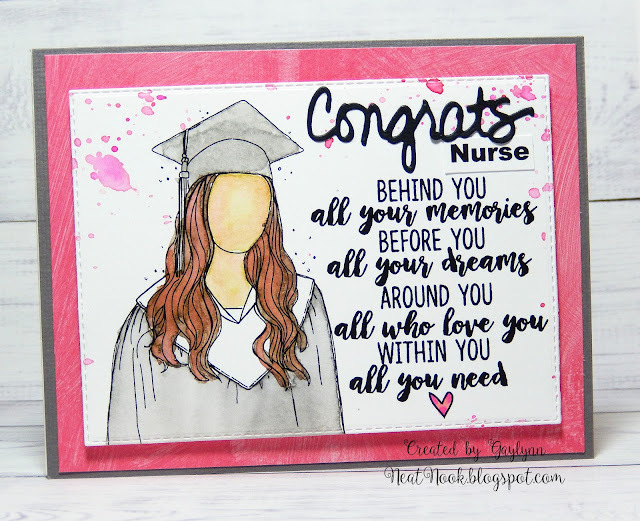 Graduation watercolor card for a nurse. This watercolor card was made special for a graduating nurse. It was personalized for her and was accented in pink and gray. Congrats Nurse. Behind you all your memories, before you all your dreams, around you all who love you, within you all you need. This is a remake of similar ones I have made in the past, but personalized. Here is a closer look at this pink version. Supplies: Unity Stamp Co. Graduation Wishes and Sentiments for Graduates, Ranger distress markers and archival ink, My Creative Time dies, water brush and watercolor paper. Hello, it's Gaylynn with a Christmas holiday goodie bag project up on the CardMaker blog today. This is a favor bag filled with mints. It is decorated with a glitter gift tag and with burlap and lace accents. To read more about this project and for more photos, visit the CardMaker blog. Supplies: Unity Stamp Co. Warmest Wishes by Tierra Jackson, Copic markers, Spellbinders dies, doily, lace, burlap paper, glassine bag, gold cording and glitter glue. Framed heart inspirational handmade card. This card was made with a beautiful feather frame and heart. It is accented with glitter and includes a lovely inspirational message. Sentiment: Live simply. Love generously. Learn constantly. This card is great for any inspirational or love occasions like engagement, wedding, bridal shower, anniversary, Valentine's Day or just because for family and friends. 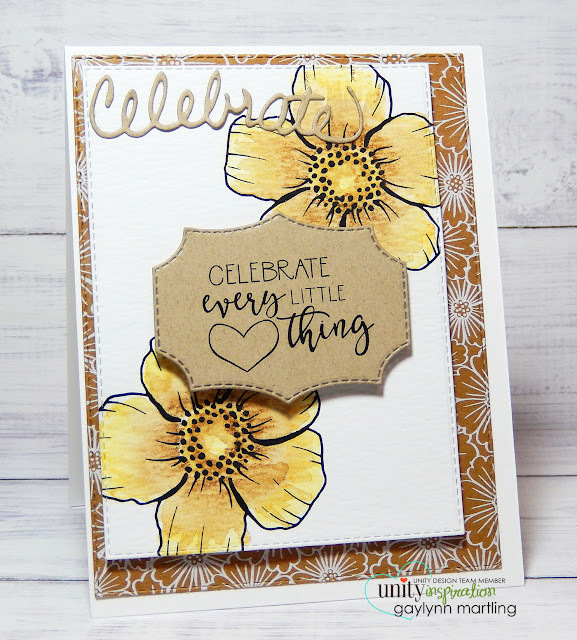 It sparkles with accents and it includes layers of kraft color die-cuts. Here is a quick video tutorial. And here is another look at the card. Supplies: Unity Stamp Co. December 2017 Sentiment Kit Things Will Work Out by Lisa Arana, Copic markers, glitter glue, dies by My Creative Time and My Favorite Things. Hello, it's Gaylynn with a project for the blog hop with CardMaker and The Project Bin. 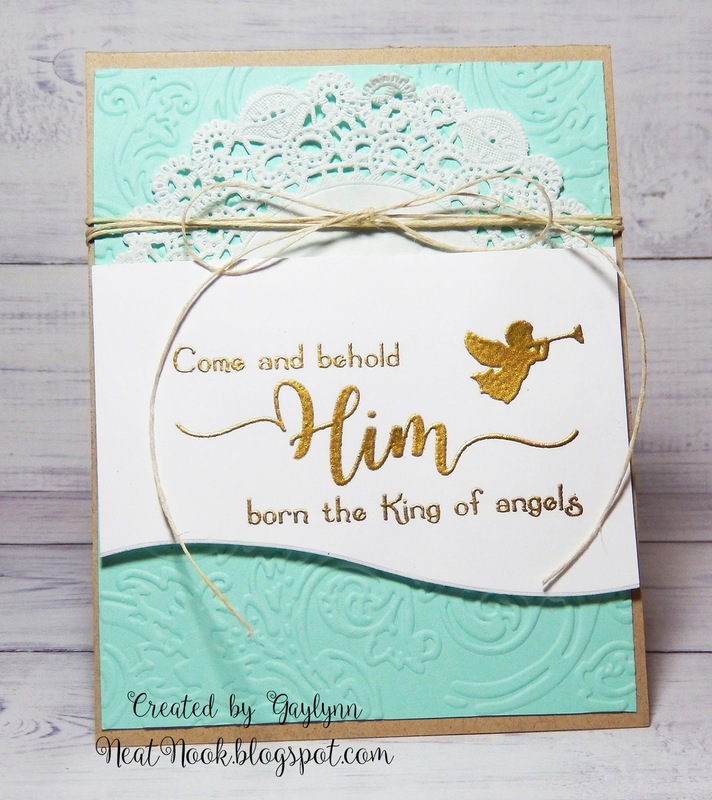 Sentiment: Come and behold Him born the King of angels. This is from the Joyful Song stamp kit by The Project Bin. I love all of the beautiful sentiments which are perfect for the inside and the outside of Christmas cards. For this card, I embossed a background panel, trimmed a sentiment panel and heat embossed the angel and the sentiment in gold. I added a bit of doily and hemp to finish it. This sparkles so much more in person. It is difficult to capture that in a photograph. This is a set that I will be using for more Christmas cards as well as for bible journaling. Supplies: The Project Bin stamp set Joyful Song, Simon Says Stamp cardstock, Ranger embossing powder, VersaMark, Sizzix embossing folder, tan hemp and BoBunny doily. Be sure to leave a comment on each blog in the hop. 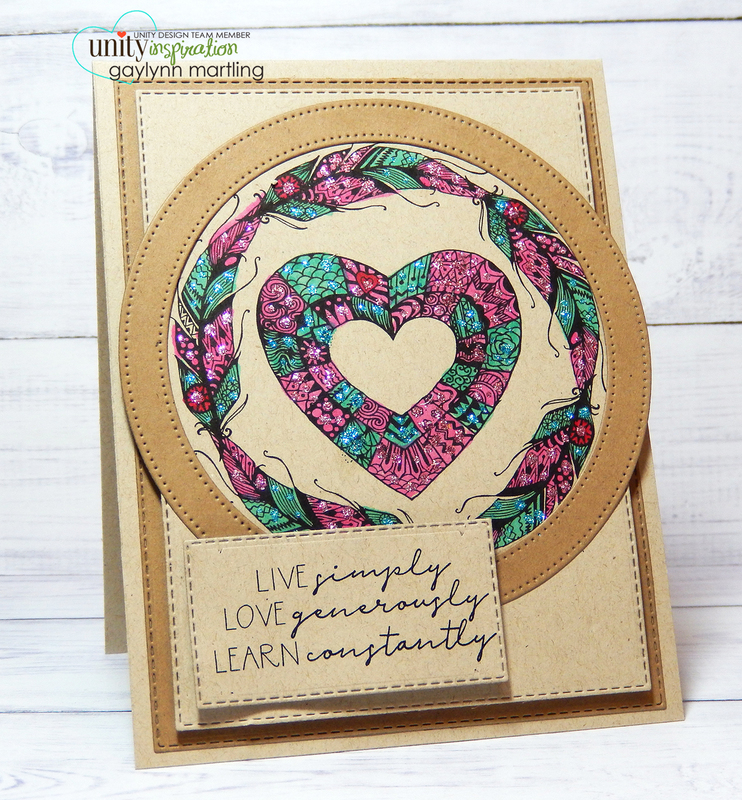 The full blog hop list is on the CardMaker blog. Watercolor magnolia flowers and iridescent foil. Today, I am sharing watercolor magnolia flowers with added iridescent foil accents for the background of this card. This shines and shows the variegated iridescent polka dots better in person. To make the background, I used Deco foil and Deco foil transfer paste with a laminator. The flowers are in watercolor. I wanted a soft lavender look for them. Here is a quick video tutorial for the magnolia card. This is a closer photo of the card process. Supplies: Unity Stamp Co. Magnolia Flowers by Graciellie Design, deco foil, deco foil transfer paste, laminator, Tim Holtz Ranger distress markers, water brush, My Creative Time dies, Canson watercolor paper, spatula and My Favorite Things stencil. Angel girl vintage gift tag or bookmark. This is a vintage style gift tag or bookmark featuring an angel girl with an uplifting quote. She made broken look beautiful & strong look invincible. She walked with the universe on her shoulders & made it look like a pair of wings. The flowers are made from dies and a repurposed dictionary page and then fastened with brass brads. I distressed the layers and the flowers for a vintage look. 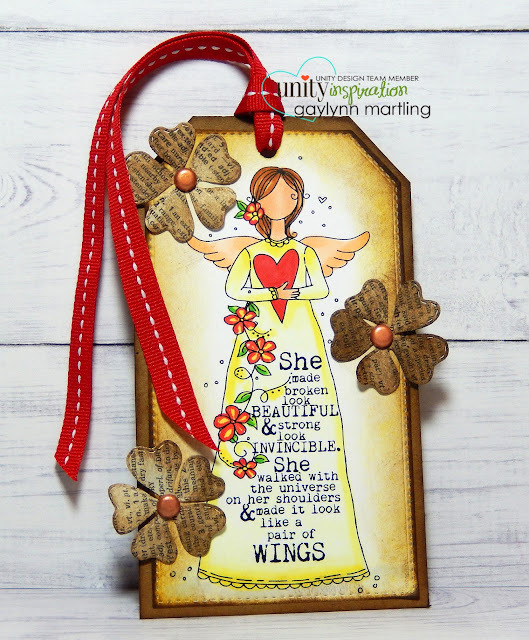 Here is a quick video tutorial for this vintage angel tag. Supplies: Unity Stamp Co. Broken Look Beautiful by Angie Blom, Tim Holtz Ranger archival and distress ink, brads, dictionary, ribbon, paper trimmer and My Favorite Things die-namics. Christmas gift card holder project for the CardMaker blog. Hello, it's Gaylynn. 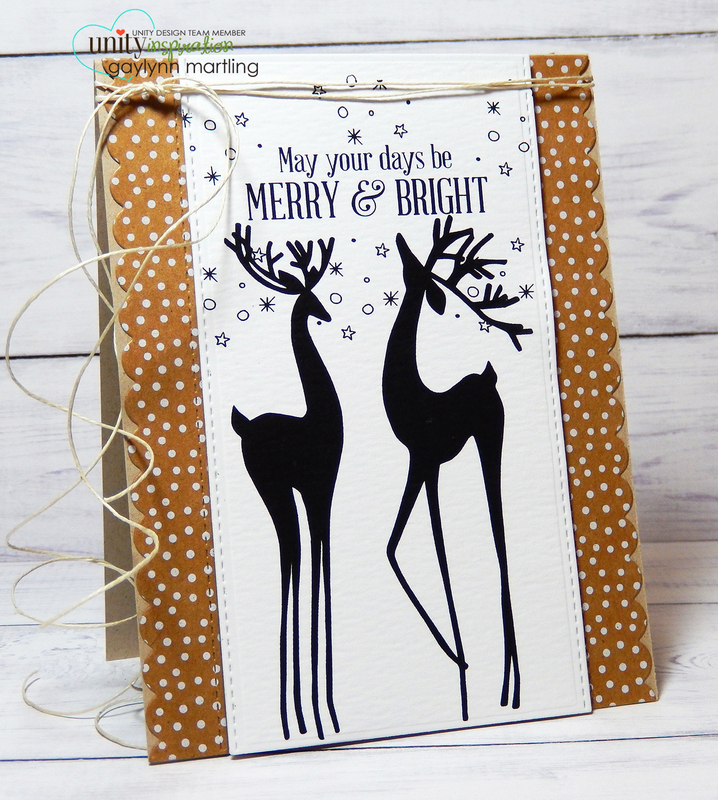 Today, I am up on the CardMaker blog with this handmade Christmas gift card holder project. This is a decorated handmade Christmas holiday gift card holder. I used lots of die-cuts for this but it can easily be cut and scored to fit your gift card. Finished size is 4”x3.5” closed and 8”x 7” opened. This is a holiday card and gift in one. Supplies: My Creative Time dies from the sets Chocolate Greetings Stamp Set Revised, Embossed Gift Card Holder, Scalloped Stitched Rosette and Scallop Stitched Circle. Also, glitter paper, DCWV cardstock, hemp, Ranger archival and distress ink. Funny & snarky gift tags or bookmarks. 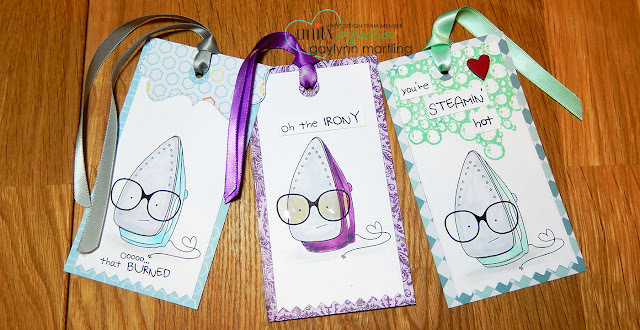 Here is a set of gift tags or bookmarks offering up snarky and funny puns. On each of these, I use a different technique. I made a quick tutorial for each for creative ways to accent gift tags. This iron is perfect with these fun sentiments. For this tag, I made a handmade topper using a scored die-cut. 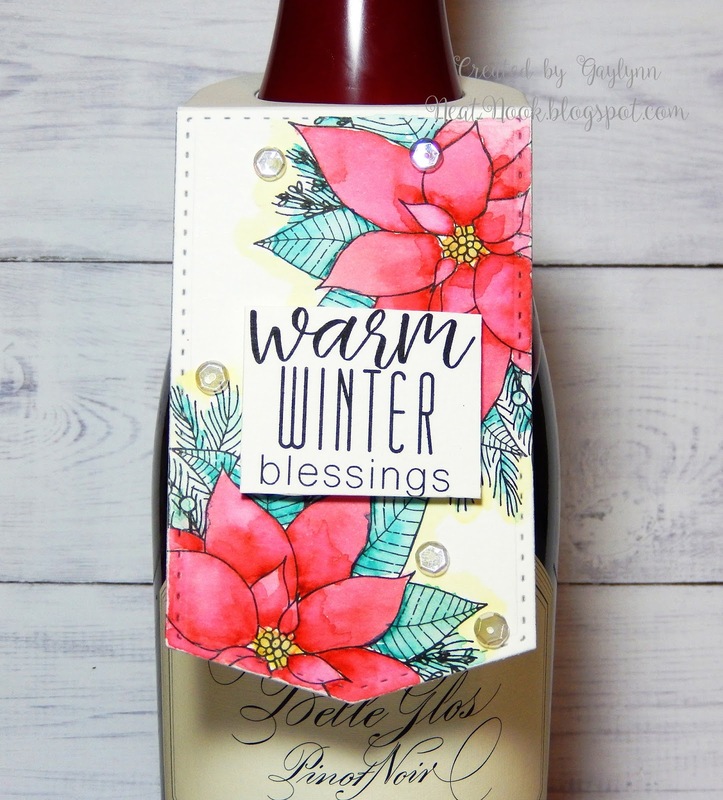 This fun tag was given a steam cloud with stamping and embossing. Here is a how I made the steam effect. On this tag, I added glossy accents to his eyeglasses. In person, it shines. It is so easy to do. Here is a quick video tutorial on the way I glossed the eyeglasses. Supplies: Unity Stamp Co. The Irony by Lisa Arana, Inkssentials Glossy Accents, Copic markers, Dies by My Creative Time, My Favorite Things and Lil' Inker Designs. Fun, right? I had a blast making these. Pregnancy or expecting Mommy card. This is a decorated handmade card celebrating motherhood. Sentiment: Oh baby, you are a blessing. I made a quick video tutorial with a simple way embellish with lace trim. Bible journal or planner art tab. 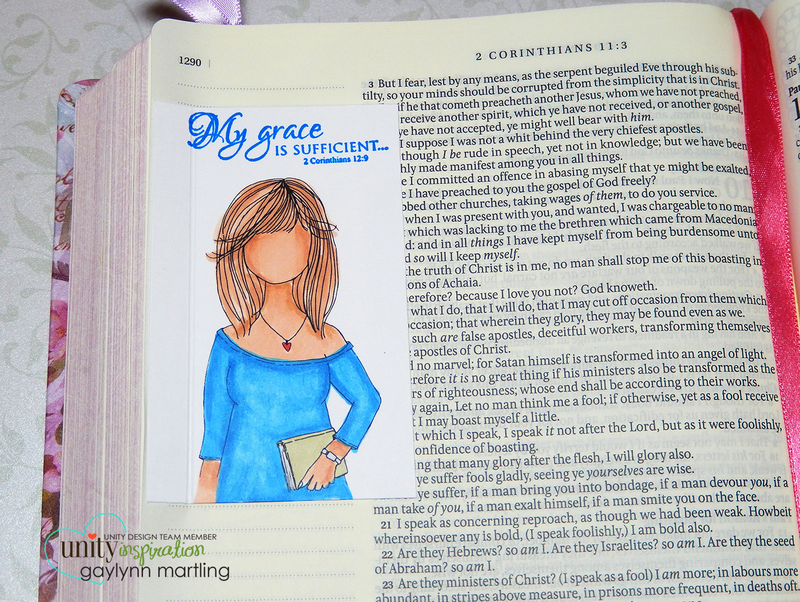 Here is a decorated bible journal page with stamped art. My Creative Bible is the brand that I use and it includes journaling space on the sides of each page. But sometimes, there is not enough room for the full image or sentiment that I want to include. So I make foldable tabs for some of the art. These panels are a favorite solution of mine. This panel is scored and adhered on one end, allowing the tab to fold over to read the text on the page. I just do not like to cover the words permanently. Another great use for them is for stamping and coloring with mediums which may bleed through to the back of thin bible pages. For this example, the stamping was colored in with Copic markers onto cardstock. Adding this panel protects the bible page and the page behind is undamaged and unstained. For this page, I used a stamp designed for planner art and paired it with an inspirational sentiment stamp from a different kit. Mixing up stamps and using them in different ways is another favorite thing of mine. I made a quick video tutorial for this bible page tab. I have posted a series of articles on ways to decorate bible journals. I have experimented with different mediums for use in the process. To read more posts about my process and projects, click bible journal. Supplies: Unity Stamp Co. Planner Gal: Call It A Plan by Angie Blom & The Vine by Graciellie Design; My Creative Bible, Copic markers, Ranger archival ink, cardstock and a scoring board. 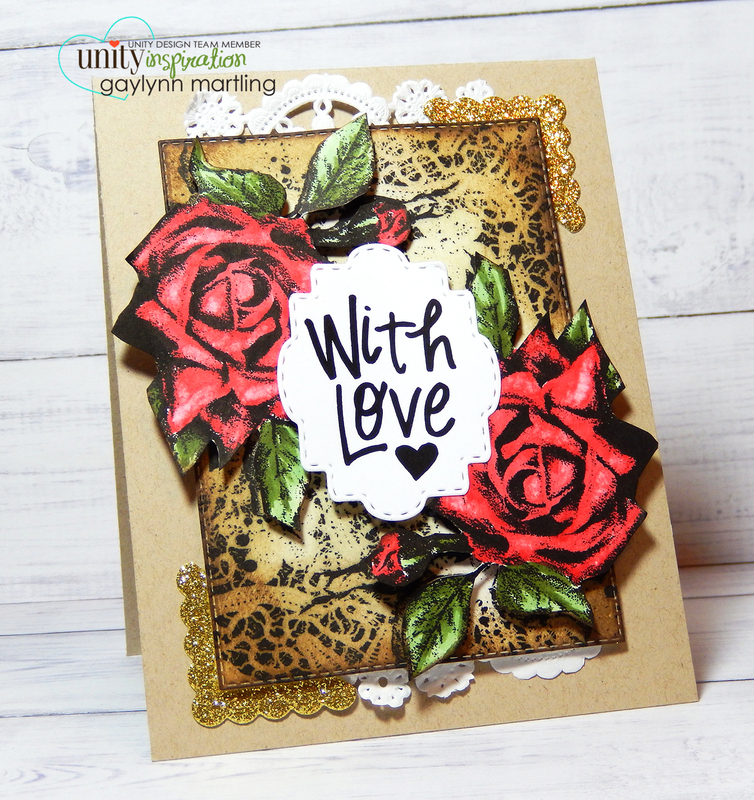 Layered roses card for Unity's SMAK Saturday. Hi, it's Gaylynn here with a project that is up on the Unity blog today featuring their SMAK monthly membership kit called Feel & Give Love. This card is filled with vintage layers. I used repeat stamping, added rose layers, doilies, glitter corners and distress ink. I wanted a vintage feel and a romantic look. This card is great for most occasions, including love, anniversary, wedding, birthday, congratulations and more. I made a quick video tutorial for this project. View in 1080p HD quality. Supplies: Unity Stamp Co. Nov. 2017 SMAK Feel & Give Love and Nov. 2017 Poinsettia With Love Sentiment Kit; Ranger Archival and distress ink, Copic markers, glitter paper, doily, dies by My Favorite Things and My Creative Time. Rose gold foil accents, a flower and bees. This is another garden themed card for a birthday. Sentiment: Beautiful birthday wishes to a beautiful birthday girl. This card sparkles more in person. It is accented with rose gold foiling. I just love the flower and those bumble bees. This was colored with Copic markers with a little shadowing to make it come to life. I had honeycomb paper that goes perfectly with the bees. Here is a quick video tutorial on the foiling process. 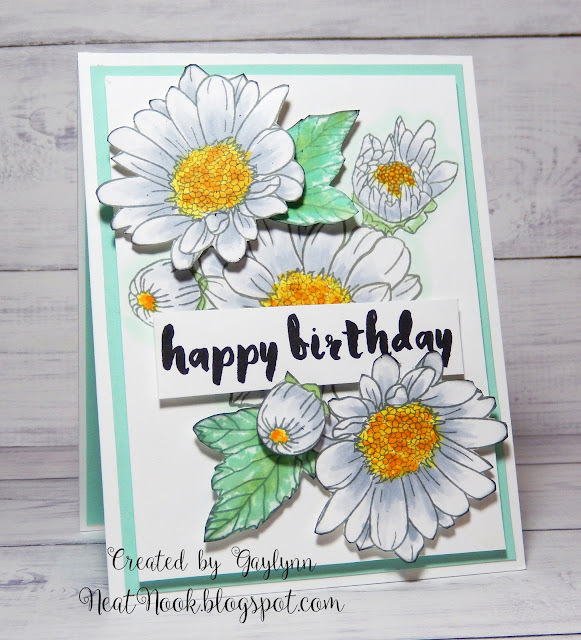 Supplies: Unity Stamp Co. Beautiful Birthday Wishes by Graciellie Design, MFT die-namics, BasicGrey paper, Therm-O-Web deco foil and foil pen and Copic markers. 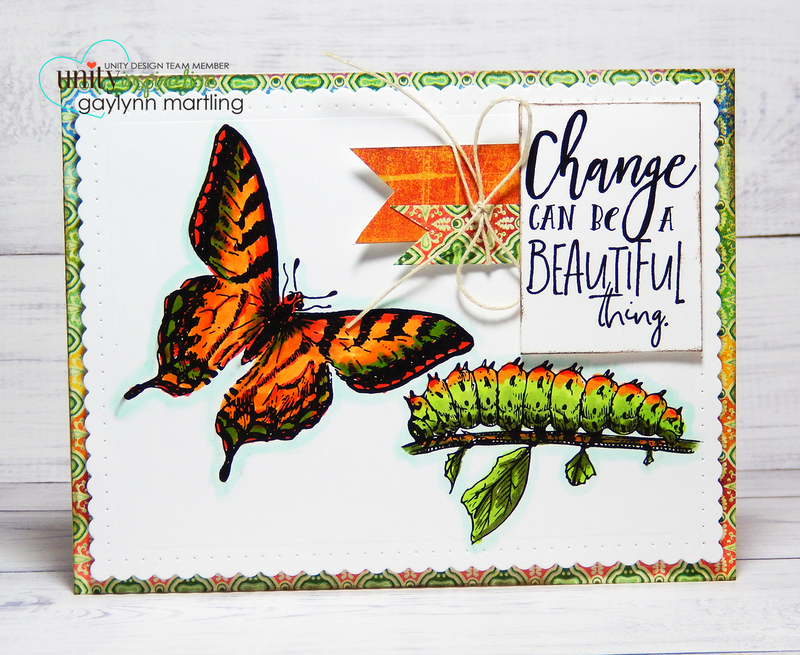 Caterpillar & butterfly inspirational card. Here is a garden themed caterpillar and butterfly card for encouragement or inspiration. Sentiment: Change can be a beautiful thing. I used Copic markers and patterned paper to accent this card. The sentiment tag was embellished with excess patterned paper made into flags. This is an easy way to dress up projects. I made a quick video tutorial showing one way that I make flag accents. Supplies: Unity Stamp Co. Spark by Graciellie Design, Copic markers, BasicGrey patterned paper, Winnie and Walter dies and hemp. I hope you have a happy Thanksgiving weekend. For the CardMaker technique post, click here. 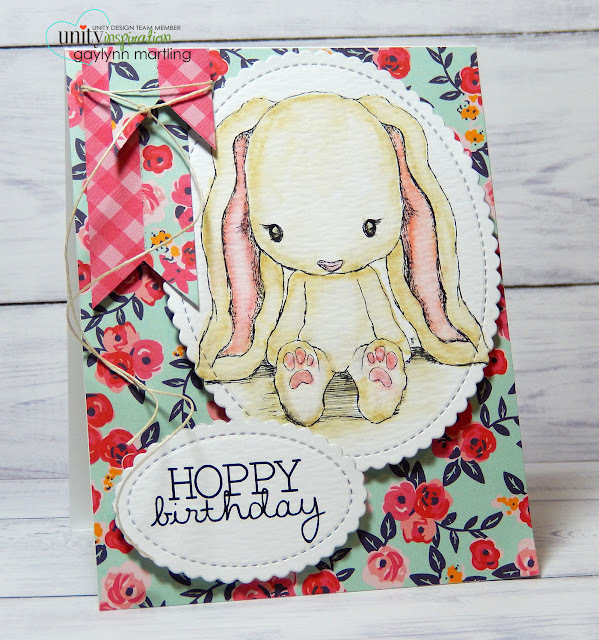 Hi, it's Gaylynn with a sweet bunny birthday card for the Unity Stamp Co. blog hop. Be sure to visit all of the blogs listed below for tons of inspiration. This is one of the newest releases at Unity with the cutest pun sentiments to match. For this bunny, I used soft watercolor and then die-cut two scalloped panels. The tiny banners were trimmed with scissors to match the floral patterned paper background. Here is a quick tip video for this bunny card. And here is a closer look. Supplies: Unity Stamp Co. Cuddlebug Bunny by Tierra Jackson, Ranger watercolor paper distress markers and archival ink, My Favorite Things die-namics and American Crafts Pebbles paper by Jen Hadfield. Now hop along for prize chances and to see more goodness. Then shop Unity. For the Unity blog hop post, click here. Today, I am up on the CardMaker blog with a technique and tutorial for adding dimension and texture to your paper craft projects. This is a technique that I use often. It is easy and adds a 3-D look and texture. To see the full article and tutorial, visit the CardMaker blog. Supplies: Altenew stamps Spring Daisy and Painted Greetings, Ink by My Favorite Things, Simon Says Stamp and Ranger, Mini Misti, foam adhesive, Copic markers C1, C3, G21, YR24, YR23 and Y13. Adorable puppy dog birthday card and tutorial. This is one of my favorite birthday cards. It features a puppy dog in watercolor. For this card, I watercolored the dog and then fussy cut him out. Then I placed him onto a die-cut lacy background. I used another cute pun sentiment for him. You can see the process in the dog card video tutorial. 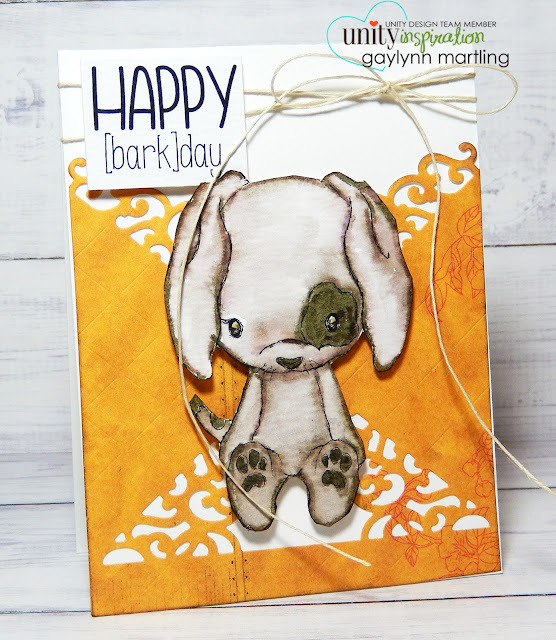 Supplies: Unity Stamp Co. Cuddlebug Puppy by Tierra Jackson, Spellbinders dies, BasicGrey paper, Ranger distress markers, Archival ink and watercolor paper. I hope you enjoyed this cutie. Cuddlebug piggy card with paper layers. Here is another sweet card with one of the newest Unity Stamp Co. releases called Cuddlebug Pig. Sentiment: Squeal. I'm so excited for you. This cute little pig tag card is great for congratulations, baby shower, pregnancy or expecting occasions. It was made vintage style with layered papers and watercolor. Here is a quick video tutorial for this pig card. Supplies: Unity Stamp Co. Cuddlebug Piggy by Tierra Jackson, Ranger watercolor paper and distress markers, My Creative Time dies and BasicGrey paper. I hope you enjoyed this rustic style card for today.